adidas and Boston Marathon Announce Contract Extension Nike Partners with Seminal Hip Hop Group De La Soul to Release ARE YOU IN? This is the first in a series of three articles on national coaching manuals. FIFA is the governing body in soccer world wide. Below that, there are regional bodies (Concacaf in our case). At the national level, US Soccer is the governing body that oversees all national/olympic team, professional (MLS, USSL, PSL, WPL, etc. ), and amateur play. Obviously that is a lot to cover in just over 300 pages, but it does a remarkable job. Most techniques are covered in one or two pages with a description, tips, illustrations and common mistakes. Goalkeeping actually receives as much attention as the field players. Since this position is unique, it is usually the focus of or ignored by most manuals. Tactics are described at an introductory level, but include graphics that explain the text. The laws are described briefly with some diagrams, but off-sides requires a much better definition. The coaching section focuses on an age appropriate environment. There is a small blurb on each age/development group and what to expect from these players. The book includes details field sizes, warm-up/cool down and injury prevention. The final section of the book is the games. They are grouped by technique/tactic in order to make practice planning easier. Each game has a name, rules/set-up, benefits (targeted techniques or tactics), phase (tactical group size – i.e. individual or large group), and age recommendation. Some games also have diagrams to explain the field set-up or appropriate player movement. Most of the games are less than a page in length and would run 10 to 15 minutes in practice. The book itself is visually stunning. It has hundreds of full color photographs and 3D graphics to illustrate the material on heavy bond paper. The margins are wide and there is room to write notes. It is every well organized and can be read cover to cover or as a hunt and find reference manual. Unfortunately, it is a paperback with a glue binding. As I move through the book, I found myself wishing it had been published as a binder. I would love to be able to insert my practice plans for future session. I also wanted to lay the book flat to make it easier to highlight and read while writing. I wonder how long it will take for the binding to break and for pages to start falling out. Over all, this manual should be in every coaches library. For recreational coaches, this probably covers every topic you need. For club and amateur coaches/players, this provides insight into the US strategies and development program. For professional coaches, this is THE Official Manual. 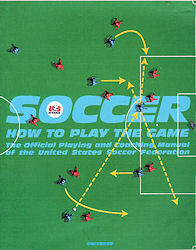 Soccer: How to Play the Game; The Official Playing and Coaching Manual of the United States Soccer Federation is published by Universe Publishing. Universe is a division of Rizzoli International Publications, Inc.